I sat on my deck, hands in the "mud", filling cups with dirt, setting filled cups on seed trays, wetting the dirt with warm water, putting one tiny seed in each cup, and finally putting the plastic seed tray lid on each tray. When I got into bed last night, I /fell/ into bed. Such a good feeling! However, it's mid March in Ohio. Snow is in the forecast for Wednesday. Therefore, right now my garden is in my kitchen, snug and warm on a shelf-unit with wheels which can move out of the way if necessary, up against our warm glass-deck door. This year I'm beginning to appreciate the cost-savings of gardening. 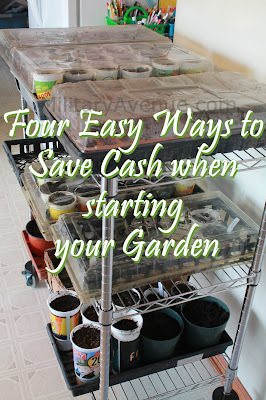 I have been herb & vegetable gardening for almost ten years now and so have grown to appreciate the investment that it takes to get it all started. 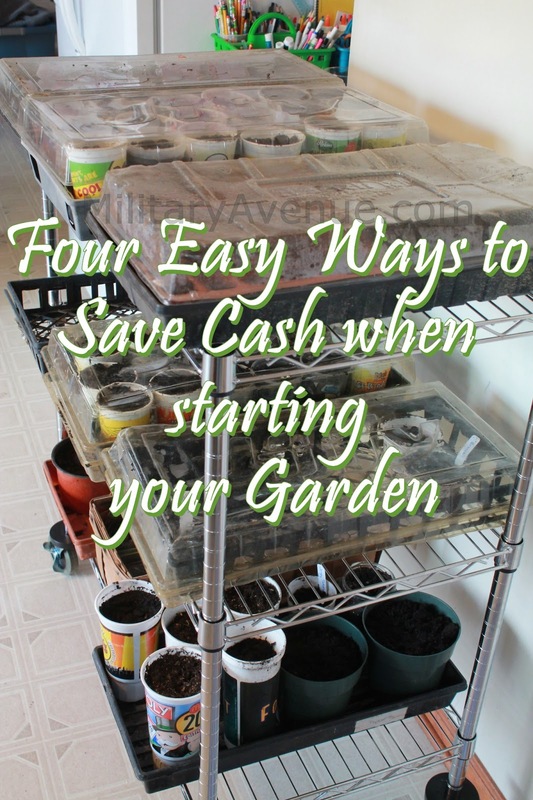 If you are thinking of undertaking a garden here are four easy ways to save a little money. What have I started so far? Tomatoes, broccoli (I've never grown broccoli before), hot peppers, sweet peppers, basil, rosemary, & marigolds (good for keeping our rabbits out of the garden). I have more in the works but I don't start my cucumbers, lettuce, carrots, sunflowers, peas, or beans indoors. They get to wait till the ground is freshly rototilled and grown right in the great outdoor dirt. How about you? Do you love to garden? What do you grow? What haven't you every grown but want to try someday? What I wonderful post :) I founf it via pinterest and have to repin this. I got these self watering pots for christmas, but I still have not had the courage to plant anything yet... I might have to start soon though! Just found your blog, also via pinterest. I too discovered the toothpick trick last year...glad to see you passing it along! I'd like to mention that I like to recycle those rectangular plastic containers from fresh baby spinach, spring greens, and baby kale which I buy in the off season. 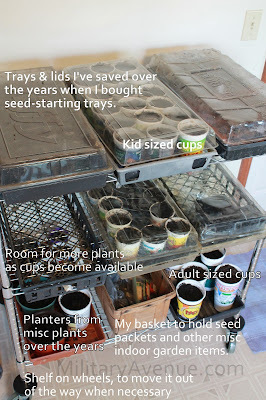 I use these with as few as 4 seeds up to 30 depending on how close it is to setting them outside or transplanting them to larger pots. I leave the top on so it is like a little enclosed greenhouse for them until they get a few leaves and grow too tall for closing the top. The few times I might get something like a sundae at McDs or a special smoothie with those domed tops, I use them as well. Leanne, I planted everything you did about the same time except the rosemary. Here in New England I still have two feet of snow on the ground and single digit temperatures. P.S. Remember everyone to put in drainage holes...and a teaspoon of activated charcoal in the bottom works great too. Good luck everyone!